Oh yes, this recipe is for a paleo buttery biscuit. Most in the paleo tribe are okay with the healthy fats of a grass-fed butter…but no worries for those of you who prefer to skip the dairy. It’s rare for me too. You can substitute the butter in this recipe with coconut oil, but you’ll miss out on that hot-out-of-the-oven buttery taste. If I’m going to have a biscuit, I just prefer to make it with butter. A couple of good brands you might want to try are Kerrygold and Organic Valley. This kitchen experiment was a pleasant surprise. Well, the second version was at least. The first batch resembled hockey pucks – in both looks and weight. Ugh. But I’m a determined girl and my patience finally paid off. Yay! This paleo biscuit also had to be easy – most of us don’t have time for the labor intensive stuff. And, I wanted it to be pretty light and fluffy too. 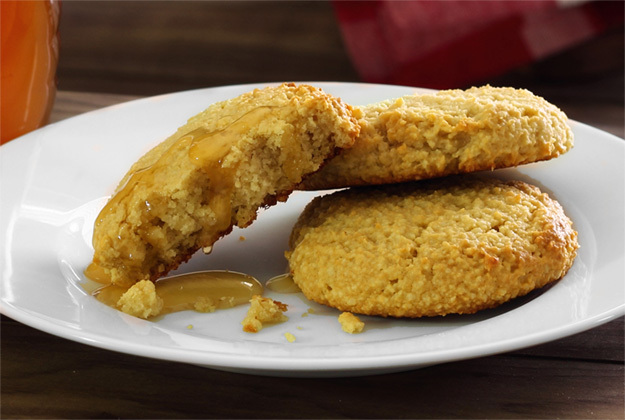 The rich flavor and texture really reminds me of a biscuit crossed with cornbread. Of course there’s no grains or gluten in this baby! I was so happy with it I jumped up and down. We had it with my Paleo Crockpot Chili and my husband agreed this paleo biscuit recipe was a definite keeper! These paleo buttery biscuits are great with a little raw honey drizzled over them while they’re still warm. Another plus was they were still good the next day. They stayed soft and light. Granted all biscuits are best fresh out of the oven, but we were thrilled to have it with eggs and a little sweet apple butter the next morning. The possibilities are endless…you can add your favorite herbs or whatever spices you like to the mix before baking. Play around with this biscuit recipe and see what you come up with! I hope you enjoy this one as much as we do. It will be a new paleo staple in our house! Enjoy warm out of the oven plain, or with your favorite spread or topping! Made these today using ghee. They were very good. I put strawberry “real fruit” jam on top. They were delicious. Thanks for the recipe. I made these today using ghee and they are great – thank you! That’s a great tip! I’m glad you enjoyed them! ;) Happy Thanksgiving!